Breaking news: Men care a lot about how they look, they just hide it well. (Except for Kanye West, we all know how amazing he thinks he is…) Especially on their wedding day. The guy who is perfectly content to go out to dinner in jeans and his old college t-shirt wants to be uncharacteristically pulled together on his wedding day. Brides have a million options, from classic to cutting edge, and can be overwhelmed by the decision making process…but it’s a process they revel in. Men, on the other hand, don’t always know how to pull the look they want together, or what they can do to accessorize the perfect tux in a way that makes them feel like a million bucks. Fear not! Here are 3 trends for summer that are easy to love. 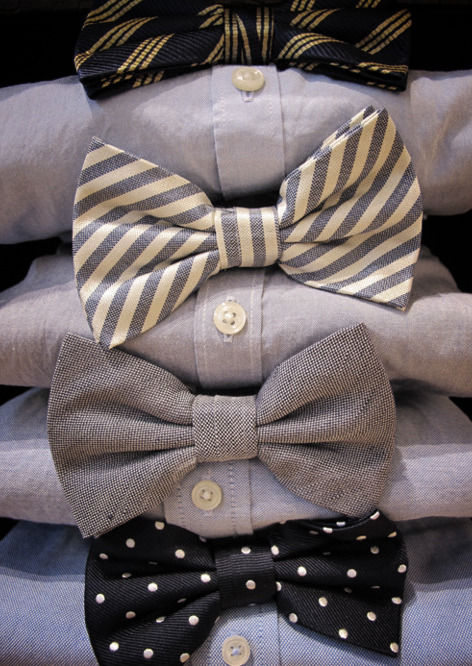 Bow ties are smart and even a bit whimsical. There’s something about them that implies intellectualism and modern preppiness.